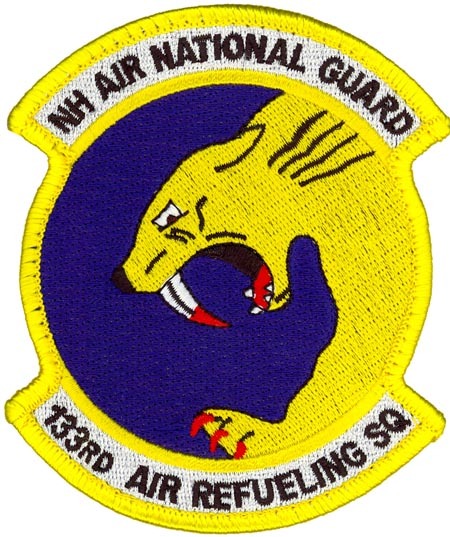 SKU: ARS-133-1001 Categories: USAF INSIGNIA, AIR REFUELING, SQUADRONS Tags: 133d Air Refueling Squadron, 157th Air Refueling Wing, Boeing KC-135R Stratotanker, New Hampshire ANG, NH, Northeast Tanker Task Force., Pease ANGS, USAF Patch, worldwide aerial refueling. Lineage. Constituted 383d Bombardment Squadron (Light) on 28 Jan 1942. Activated on 2 Mar 1942. Redesignated: 383d Bombardment Squadron (Dive) on 27 Jul 1942; 529th Fighter Bomber Squadron on 30 Sep 1943; 529th Fighter Squadron on 30 May 1944. Inactivated on 6 Jan 1946. Redesignated 133d Fighter Squadron, and allotted to the New Hampshire ANG, on 24 May 1946. 133d Fighter Squadron extended federal recognition on 4 Apr 1947. Redesignated: 133d Fighter-Interceptor Squadron on 1 Feb 1951; 133d Air Transportation Squadron on 1 Sep 1960; 133d Military Airlift Squadron on 1 Jan 1966; 133d Tactical Airlift Squadron on 11 Sep 1971; 133d Air Refueling Squadron on 1 Oct 1975-present. Assignments. 311th Bombardment (later Fighter-Bomber; Fighter) Group, 2 Mar 1942-6 Jan 1946. 101st Fighter-Interceptor Group, 16 Apr 1956; 157th Air Transportation Group, 1 Sep 1960; 157th Military Airlift Group, 1 Jan 1966; 157th Tactical Airlift Group, 11 Sep 1971; 157th Air Refueling Group, 1 Oct 1975; 157th Air Refueling Wing 31 May 1992-present. Stations. Will Rogers Field, OK, 2 Mar 1942; Hunter Field, GA, 4 Jul 1942; Waycross, GA, 19 Oct 1942-18 Jul 1943; Nawadih, India, 17 Sep 1943; Dinjan, India, 19 Oct 1943; Pungchacheng, China, 23 Aug 1944; (detachments operated from Hsian, China, 18 Sep-30 Oct 1944 30 Mar-Aug 1945); Hsian, China, Aug 1945; Shanghai, China, 22 Oct-14 Dec 1945; Ft Lawton. WA, 4-6 Jan 1946. Grenier Field, NH, 4 Apr 1947; Pease AFB (later Pease ANGS), NH, Jan 1966-present. Aircraft. V-72, 1942; A-36, 1942-1944; P-51, 1944-1945. P/F-47D, 1947-1952; F-51H, 1952-1954; F-94A/B, 1954-1958; F-86L, 1958-1960; C-97A, 1960-1967; C-124C, 1967-1971; C-130A, 1971-1975; KC-135A, 1975-1984; KC-135E, 1984-1993; KC-135R, 1993-present. Operations. Combat in CBI, 16 Oct 1943-14 Aug 1945. Called to active duty as part of the Korean War call-up, 1951. Air defense of Northeast US, 1951-1960. Called to active duty as part of the Berlin Crisis call-up, 1961-1962. Provide airlift and air refueling capabilities. Participated in Operations Desert Shield/Storm, 1990; Operation Restore Hope, 1993; Operation Northern Watch, 1997, 1999. Since 1994, operates the Northeast Tanker Task Force together with the Maine Air National Guard. Campaigns. India-Burma; China Defensive; China Offensive.